John Willis Homes, Inc. is doing a lot of homes in my neighborhood. I think the experience from many so many renovations here give them a broader repertoire of styles than most design/builds outfits.. That includes Tudor-blend-ins. Here is house 1 of 5, house 2 of 5, house 3 of 5, house 4 of 5, and house 5 of 5, house 6 of 5. house 7 of 5. I was surprised to see this on the sign: brick, stone detailing, dovecotes and a "Voysey gable." Would it really look like this? This is 3563 square foot teardown sold before it was finished. I just couldn't imagine it. It's a tiny lot 0.193 acres. This picture makes it look like a big isolated lot but that's just the foliage. It shares a driveway with the house on the right. This one will catch your eye. I think it's very good. Usually a magician never tells but I think you need to see a side view. Teardown 3 is the 3rd one in the picture. The south elevation is more interesting than the front. Here is house 1 of 5, house 2 of 5, house 3 of 5, house 4 of 5, and house 5 of 5, house 6 of 5. house 7 of 5..
Five neighborhood tear-downs are complete. Here is the second, a spec house on .2297 acres sold before it was complete. It's by Phillip Pettis Homes, Inc. I think Philip and I are on the same wave length. I blogged another project of his on Merton. I carefully studied the street and the entire 4 block area and sketched the front to fit in .... your thoughts? You may be interested to know that it is the smallest new house I have ever built... our focus is on "smart sized homes" that are highly energy efficient....not McMansion's. This one started in a "Morningside" "Tudor-ish" style, built in 1930, renovated in 1960 according to Redfin. It was perhaps a 1,200 square footer when built. This isn't a bad look but Tudor isn't in thing right now. 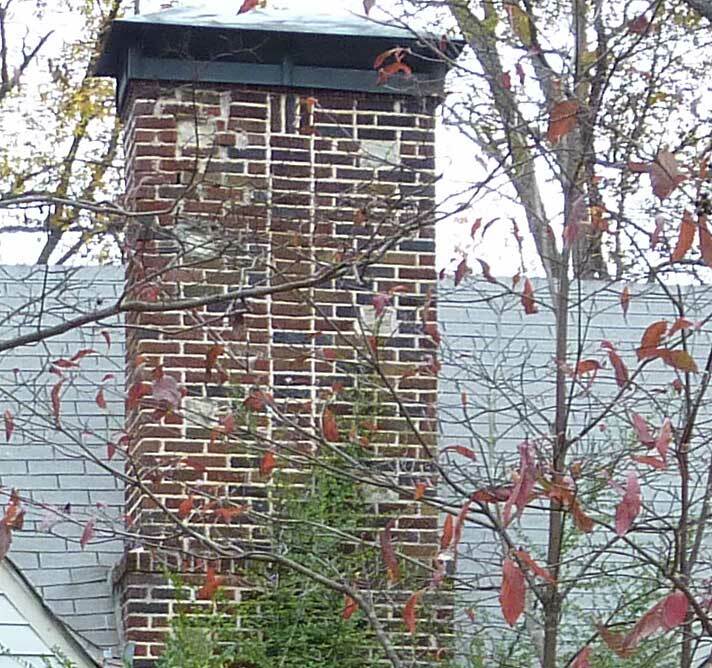 I loved the chimney though it was mosly hidden in the bushes. The add-on didn't look so good, shown here stripped of its siding, perhaps asbestos siding. The "new" addition was the last to fall. It had a style soul-mate on the right, a low rancher duplex on the left. The demo guys said the old part was tough, the new part was easy. You can see the house in context with the neighbors about halfway though this video. Here is the glamor shot with crepe myrtle. I don't know where you come down on teardowns. I think this one is pretty darn good. Next: House 3 of 5 isn't like this one. Five neighborhood tear-downs are complete. Here is the first. When you see a house in full silt-fenced, required-signage glory, you just know. 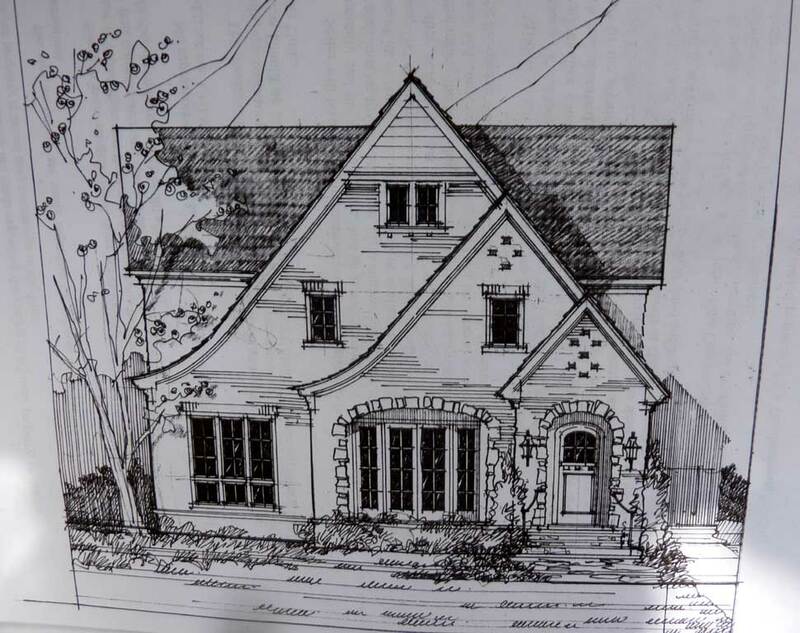 Certainly a late infill, I think it was a duplex, about 1800 square feet on 0.2157 acre. The tax records said it was built in 1930. Do you think that's right? It wasn't an eyesore. But it wasn't in the neighborhoods single-family style, old or new. I guess it was infill duplex style. It In context: an earlier teardown one on the left, a brick duplex one the right. A better view of the older teardown on the left. This is the model for most 1/4 lot teardowns these days. 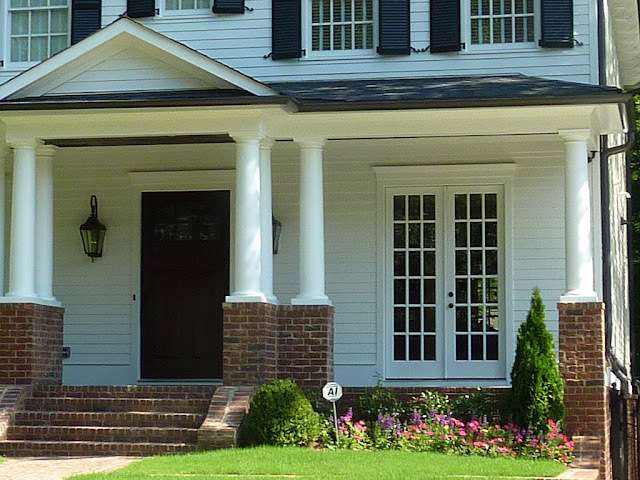 Craftsman-like, deep lot fillers with a front porch.The variation is in the refinement of the detailing. This new one will be 4651 square feet plus a garage, not a big as it could have been. I particularly like that it's low to the ground. I found myself leaning in, leaning forward, trying to get closer. They played loud and in a whisper. These days music is engineered to sound good in the car and on MP3 players. Dynamics get squeezed out else we'd constantly adjust the volume while we jogged. Not this night. It was the perfect storm of architecture tourism: a great event in a great space. 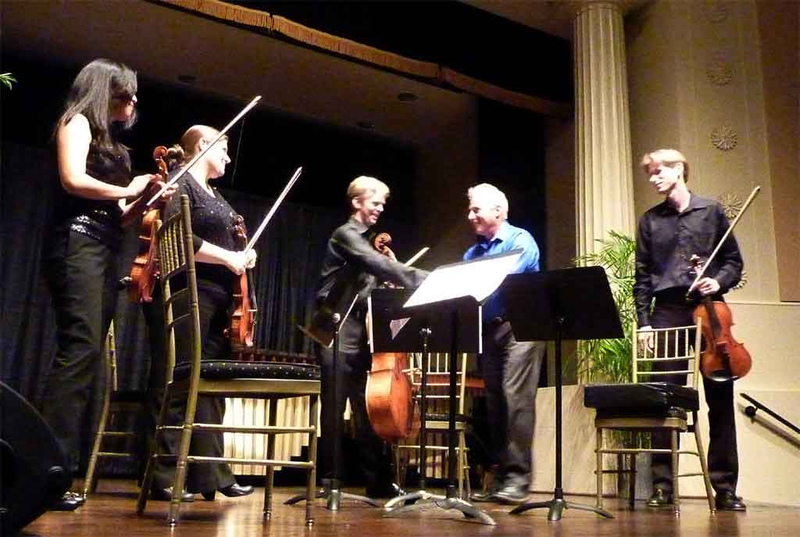 I sat 10 feet from the string quartet in the extraordinary auditorium at the Academy of Medicine. Violinists Helen Hwaya Kim and Adelaide Federici, cellist Brad Ritchie, composer Jonathan Berger, violist William Johnston. Sonic Generator is the contemporary music ensemble-in-residence at Georgia Tech. Until the music began I enjoyed the building and the people. The Academy of Medicine glowed in the low sun. The brick pavers are part of the composition, the base layer of rustication. A string quartet in a building like this? Free? Bring it on. I've been here before. It works every time. Philip Shutze designed this just for me. However grand, this room is comfortable. The rotunda is the narthex for the auditorium. There are 230 seats. It feels like an oval but it's not. The entrance wall is flat. The stage is in Turn 1. I wondered how would it sound? Did Shutze do acoustics? The stage featured two marimbas and columns in antis. Jason Freeman, associate professor in Georgia Tech School of Music introduced the show. William Johnston performed first, playing "Viola Elegy" with a recording. I stood in the very back corner. It was as if he was right beside me. I moved to the front row. It was Marimba time, left - Charles Settle, right Stuart Gerber. They performed "Piano Phase" by Steve Reich and messed with our brains (see video). Composer Jonathan Berger introduced the final piece, his own work: "Doubles" (2004). The quartet took the stage. I just don't get to do this.. I felt like I was holding each instrument, feeling the vibrations. Bravo. Mark Gresham reviewed the performances at ArtsATL.com. Did Shutze do acoustics? Somebody sure did. Did Shutze ever hear a performance in Academy of Medicine? The end of concerts are so sad. The performance is just gone. You have to leave, go back to eating, working, and sleeping. For most of us this was the first and last time. And modern works rarely leave me whistling a melody. Yet I do have vivid memories of the performances. I remember how real and intimate it sounded, as if they performed just for me. I don't know when the Academy of Medicine will host music again. Sonic Generator will perform at the opening event for gloATL's Liquid Culture: a utopia station series July 6, 7-8 pm – Midtown – 15th Street and Peachtree Street, Colony Square Plaza. More here. If you follow me on Facebook or Twitter I'll give you a heads up. 5 Morningside Teardowns Done, the Before Pictures. 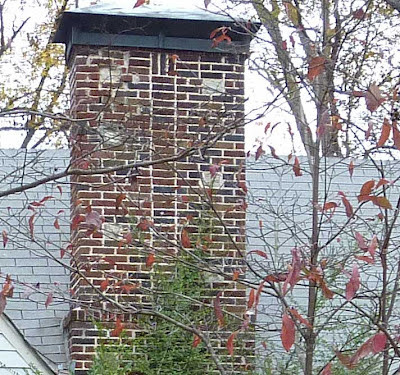 I'm going to miss the chimney but I never noticed until they marked it for demolition. 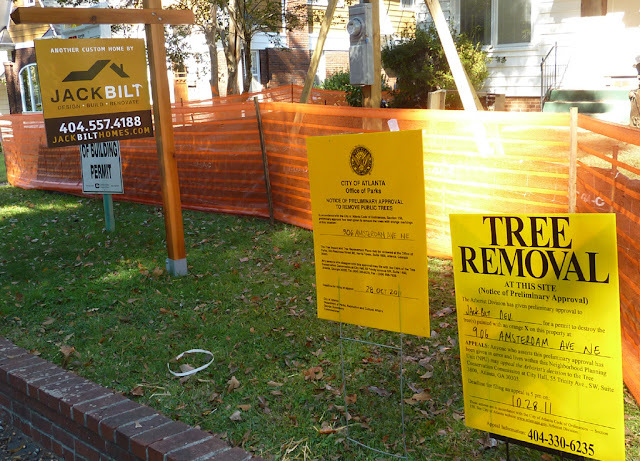 Destruction and construction are booming in some Atlanta neighborhoods. I believe this was a duplex. It's appreciated $230 between 1991 and 2011. It's a spec house and it sold before it was complete. This one had a familiar Morningside style. It's had been added on in a less than high quality way, probably an extra apartment or 2 back there. It's a spec house that sold before it was complete. This was probably the very last infill on its street. It's on a tiny lot. It did have a nice little garage. This spec house sold before it was complete. This became a custom, architect designed poptop and one of my favorite projects. It didn't turn out like the others. This was be a mid-century rancher on an ideal lot for a prestige house. They just don't build them like this anymore. Now it's an architect designed house.